Forget What Did: Bringing up the averages. 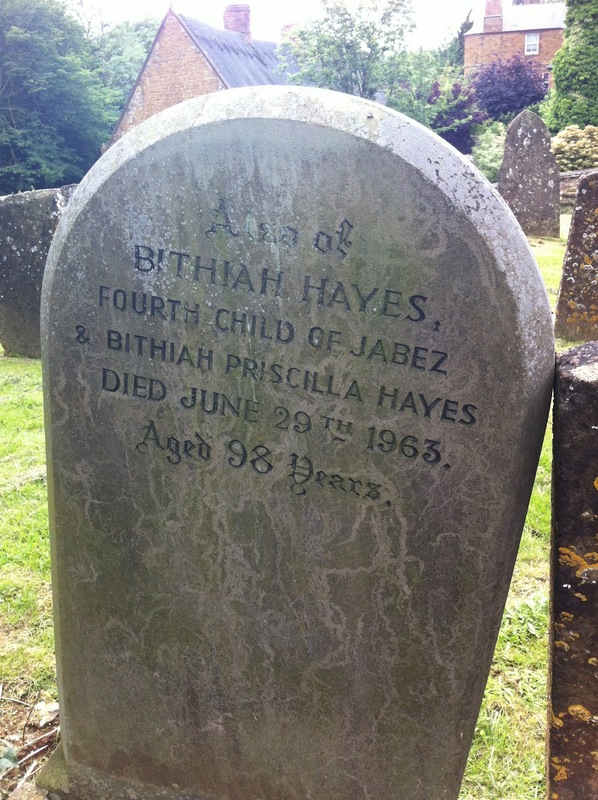 This tombstone I saw recently in an Oxfordshire graveyard tells a sad story. If you can't read it, it commemorates the three children of Jabez and Bithiah Hayes, who all died in infancy between 1859 and 1864, two within a fortnight of each another. Nice going, Bithiah Jr! Way to keep the engraver waiting. I hope you always made a big deal of Mothering Sunday. It is allowed to write on both sides? Cool, I didn't know that. But it is a sad/lovely/sort of happy ending story. Thanks for sharing. What's with the fonts? All the 19th century tombstones in America have that weird font combination, too. Old gravestones can be heartbreaking. There was one outside a very old church I used to go to many years ago for a three year old girl with a moving inscription on it which still makes me sad if I think of it today *sniff*. But the addendum to this gravestone is lovely. What a bittersweet story. If you want sad, look up your ancestors' census records (1911 and earlier so far) on a genealogy site. There's always an entry for "children who have died" and it can be half of the number actually born to a marriage. An every now and again an epidemic would wipe out those who made it past age 5. My Grandmother was the oldest of eleven children and she was born in 1893. All of them survived to adulthood, which she put down to the fact that her mother had a strange idea that milk was bad for children and never gave them any. The great aunts and uncles I remember from meeting them when I was young were all fairly puny, but alive to a good age, lack of milk probably stunting their growth somewhat, but sparing them from Tuberculosis which was redolent in cows milk. Of the men, several died in the coal mines, and several in the war. My grandmother lived to be a few months past her 100th birthday. She told me that her mother used to bake a stone of bread every day. A Stone of flour.. every single day. I can't help wondering if they're buried on the other side, too... Too morbid? That little twist was kind of heartening, though, after the tragedy of the front. Even if it led to some peculiar questions. Yay, Bithiah! One of my great-great-great-great-grandmothers was named Bithiah, a fine Old Testament name, particularly popular in Scotland in the 17th century and often spelled "Bethia". I imagine 200 years from now our descendants (should we have any)will be falling over themselves giggling at names like "Brittany" and "Madison". This reminds me of something I read about Elizabeth Cook, the wife of James Cook (yes, him). They had six children and she survived not only her hapless husband by far but all of their children because they either died in infancy or very young. I couldn't stop thinking about her for a long time because it made her seem so unfathomably sad and forlorn in the landscape of her life. It is a sad fact that in 1850 half of all children born in British cities died in infancy. Yes, 50%. Only with the advent of proper sewerage and separate fresh water supplies did things improve (and the destruction of slums). I believe that it is also the case that marriages last longer now than they did in Victorian times because women are so much less likely to die in childbirth these days. The reason the current divorce rate is so high is that people are now living long enough to get divorced. Maybe the moral of the story is that no matter how grave the situation, there's always a bright side? Puns not intended. A very bittersweet tale though! Lovely that one survived to a very ripe old age. 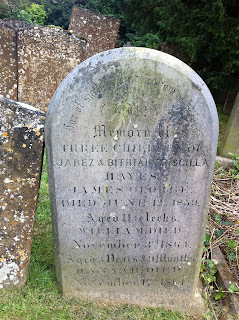 There is a monument in our local graveyard for the vicar's family from Victorian times. All four of their children are on it. The last says about the daughter being the last surviving child; none were over 8 years old. Incredibly sad and no exception for this family. Very poignant. By the way, Mr. Finnemore (if you actually read this) my family and I live in the US are huge fans of both Cabin Pressure and your Souvenir Programme. Thank you for brightening our life with zany British humour! 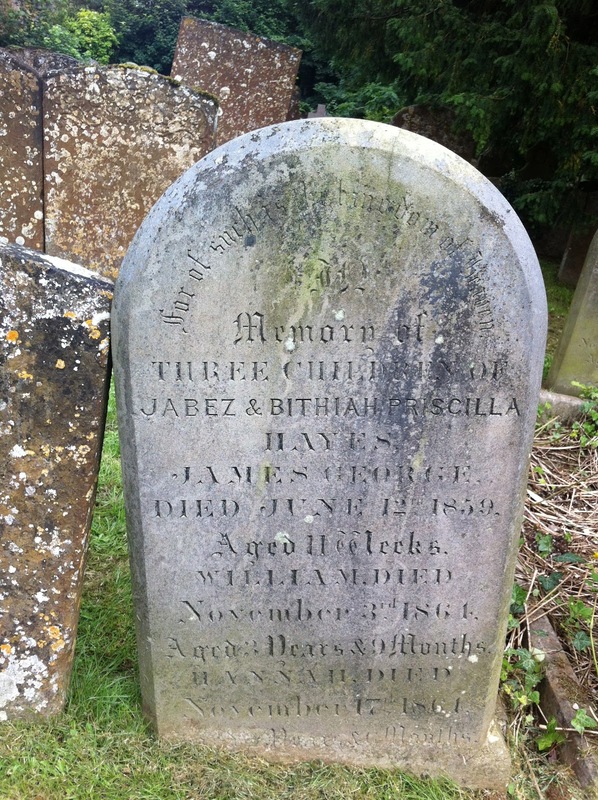 I came across a grave whilst researching various ancestors, and worked out from the ages and the years of death that a family lost twins 2 years apart in the early 1800's. Regrettably,I never got past the phrase: "Bithiah! Will you never let him go [let him go, let him go!]" and into the existential irony of the whole situation. Lovely post, John. As an archaeology student, I used to do analysis of tombstones in our oldest cemetery: child mortality was incredibly high... nevertheless the addendum in the tombstone was fantastic (and the title of the post now makes sense!). Sorry for any mistakes. English is not my first language. What if the fifth child is still alive? Your post is very useful and interesting. I liked it very much and felt beneficial for all, if they have any doubt about the above mentioned topic. We can learn some valuable tips from this blog. You can have a look on my forum, I would be waiting for your valuable response. Thanks in advance. Cabin Pressure IV - prepare for boarding.